This a list of things that I don’t have much experience with. Recently, I got the opportunity to try all three at the same time when the Recurse Center (RC) organized a two-week pop-up event for alumni focused on computer-generated art and hosted in Berlin, Germany. 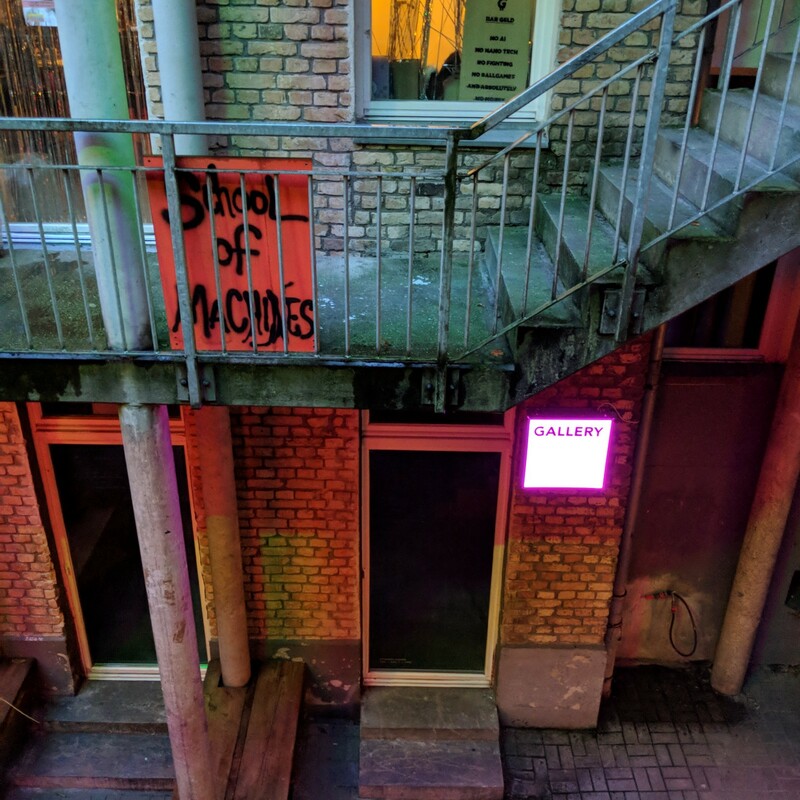 While there I explored Berlin, met wonderful people, and made computer art for the first time. The School of Machines, Making, and Make Believe. Our work-space while in Berlin. Thirteen of us converged on a work-space that RC kindly rented for us called the School of Machines, Making and Make-Believe. A lot of what is excellent about RC is how they have articulated social rules that make a space feel safe and productive. The shared background of RC was a template that we relied on to work hard for two weeks collaborating in our tiny room, in a strange city. Our space was small but jam packed with fun stuff. We made liberal use of the printer and projectors. Even playing a glitch animation on the wall as if it were the nerdiest yule log. I learned a lot about the process of art creation from my colleagues. Like how any little observation could inspire an art project; be it light reflecting from a strangers’ ring, or an iPhone advertisement. Maybe my standards have been lowered by the smoldering garbage fire that is the San Francisco public transportation system, but everything about Berlin’s U-Bahn subway is delightful to me; its timeliness, the strange station names with colorful tiles, the way it whispers “Schonleinstrasse” in its artificial quasi-feminine voice… I took the train every day and it was great so I decided to try and create a piece that captures my enjoyment of the U8 line. If you want to read more about my project, I detailed it in a separate post. My animation traveling of traveling the U8. While I can’t say that it turned out the way I envisioned it, I did enjoy the process. It reminds me of how I started learning web app development in the first place. With small side projects, mostly failures, building my intuition and skill. When I signed up for this pop-up, having not made much art with computers or traveled internationally, I knew that it would be full of the small failures and sweet successes that comes with learning anything new. It was pretty neat to get together with so many new people and immediately feel comfortable and be productive. I am very thankful to RC for organizing this pop-up, and I hope it continues as a new feature of our community.